Prequel to The Lord of the Rings trilogy and set sixty years before, Peter Jackson returns behind the camera to direct one of 2012’s most anticipated films, The Hobbit: An Unexpected Journey, the first instalment of a three-part film adaptation of J. R. R. Tolkien‘s 1937 novel, The Hobbit. Focusing on the character of young Bilbo Baggins (Martin Freeman), he is chosen by Gandalf (Ian McKellen) to accompany thirteen dwarves, led by Thorin Oakenshield (Richard Armitage), on an ‘unexpected’ quest to reclaim their stolen mountain home, the lost Dwarf Kingdom of Erebor, from a dragon named Smaug. With The Lord Of The Rings trilogy and The Hobbit books being a part of the same series, incorporating many of the same characters and being set in the same world, with each of these trilogy adaptations all being under the help of Peter Jackson, this new trilogy has a very similar feel to the LOTR films that we all love. Following a somewhat similar storyline, as a hobbit, a wizard, and thirteen dwarves set off an adventure across Middle Earth, The Hobbit has a bit of everything that we loved about LOTR and, because of that, it’s hard to fault. We knew what to expect with this film, so all it could do to not necessarily better the original trilogy but to add to the franchise respectfully, was to keep the adventure up to pace, use advanced technology to make the journey all the more breath-taking, and to introduce more unforgettable characters to make this trilogy a success on its own, but also one of equal quality. We all wish LOTR didn’t have to end, so this is our way of keeping the story going (even if it is a prequel). With Jackson splitting one book into three films, the story is, admittedly and noticeably, dragged out. Whilst I have to agree with a large part of the criticisms for this film in that it does fall short on storyline in places, and that it is padded out by a lot of walking, the film never feels slow, nor does is it become tedious in its three-hour runtime. Of course, there is a big focus on the journey itself, but these lengthy walking scenes are the some of the most epic scenes in the film overall – for example, the goblin chase and the rock giants. Whilst these scenes often went on much longer than they needed to, barely being described in the novel at all, the visuals and location shots used in these scenes were fantastic, which enabled the audience to feel like they were part of this adventure themselves. The film even does well to include some much-welcomed comedy, which the original trilogy didn’t have much of (not that it needed any). Scenes including the trolls and Gollum’s riddle really stand out in this first instalment, and it’s amazing to see how humour fits in so well in between all of the action and fantasy, without making it too gimmicky. This journey may be a little less serious than the one Frodo took, but the addition of humour brings something fresh to a similar premise. This time, we can feel like part of the adventure because it’s that ‘fun’ quality that this is all about, whilst we can still fall in love with the characters, well. The new cast additions are certainly on par with the phenomenal cast of the original trilogy, too, with many actors reprising their roles from LOTR, as well. With a brilliant set of new characters, Martin Freeman, especially, stands out as a much better protagonist to follow than the wimpy Elijah Wood. 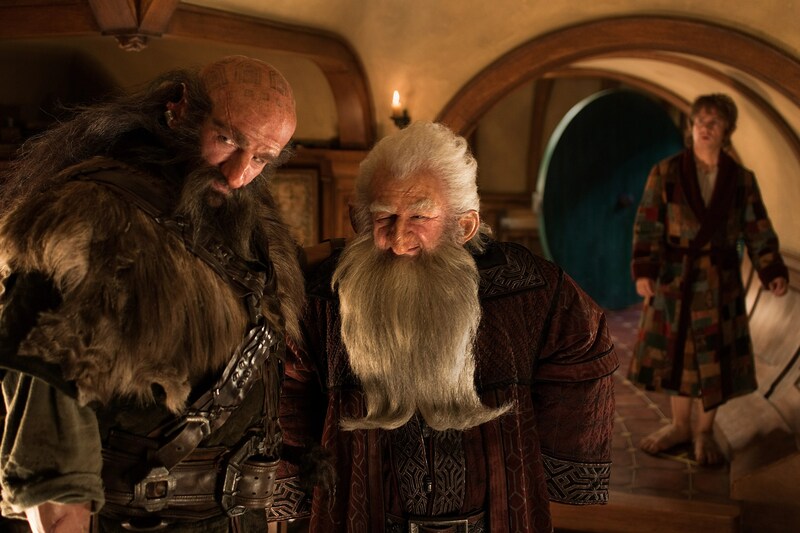 And whilst none of the actors that play the dwarves are played by actual dwarves, these characters were incredibly enjoyable, too, making the film really easy to engage with. Introduced fantastically, it’s easy to find yourself liking every single one of the dwarves individually, as they’re given their own personalities to help you remember each of them, as you spend much of the film hoping that none of them stumble off a cliff to their demise. Gollum looks fantastic, as well, with Andy Serkis putting in so much effort into his role, yet again. In relation to the book, this adaptation has few flaws. It’s a story that shouts to be adapted onto the big screen because of the classic fantasy adventure that it follows, and even if splitting the films into three instalments is a risky scheme, I wouldn’t have wanted this to be the final Middle Earth film for us to experience. The film begins with Elijah Wood reprise his role as Frodo to set the story up. Obviously, he does not appear in the book, but since we know the LOTR already, it’s a comforting introduction. The dwarves have multi-coloured hoods and beards, in the book, and arrive in a different order. In the book, Gandalf stalls the trolls until they turned into stone. In the film, this is done by Bilbo. In the book, Bilbo finds Sting and takes it. In the film, Gandalf gives it to Bilbo. Radagast is only ever mentioned in the book, and his and hedgehog, Sebastian, sadly doesn’t exist. In the film, he is one of the most memorable characters so this was a great development. The group is attacked by Orcs on the way to Rivendell, in the film. In the book, Finbul and the horde of warg riders do not exist. Azog is only mentioned in the book, as well, and he died 150 years ago. The elves are much chirpier in the books; they laugh and sing in the forest, but we do not know this side of them in any of the films. Galadriel, Saruman and the White Council meeting are only mentioned in the appendices. Bilbo and the dwarves are close to the stone giants rock-throwing in the film but, in the book, Bilbo observes it “across the valley”. In the book, Bilbo finds the ring by chance when he is crawling through one of the Goblin tunnels. In this film, Bilbo sees Gollum drop the ring during a fight with a Goblin. In the book, Bilbo can only see Gollum’s glowing eyes and hear his voice echoing through the cave during their riddles game. In the film, the cave is lit up so that we can see this scene better. In the film, Gandalf instantly slays the Goblin King. In the film, the Goblin King is knocked aside and is killed later on. The Hobbit: An Unexpected Journey is a brilliant first instalment to this new and hugely anticipated trilogy, and you’ll be dying to either see The Desolation of Smaug already, or to rewatch The Lord of The Rings over and over again.